Since its creation in 2008, the ADF has been run by a small team of individuals driven by passion and wholly dedicated to their work. In addition to the core team presented below, the organisation is working with international and Cambodian consultants, and local staff living on Phnom Kulen. The core team is made of international and local experts in charge of managing the organisation and implementing its activities on a daily basis. 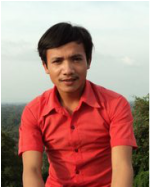 Sakada is a Cambodian archaeologist who graduated in 2009 from Phnom Penh's Royal University of Fine Arts. He has been involved in many archaeological projects for Sydney University (Australia) and Sophia University (Japan). He joined the ADF in 2009 and is the leading Cambodian archaeologist of it. 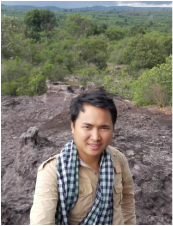 He spend his time between the ADF office in Siem Reap and the archaeological sites on Phnom Kulen. ​Since mid-2017, Sakada has taken over the local responsibility of the organisation, in close coordination with the management team. Mout is a Cambodian Childhood specialist who worked for ten years as a nurse assistant in a local health center in the village of Tbeng, near Phnom Kulen. She joined the ADF in June 2012 as Nutrition Health Officer and spent most of her time on Phnom Kulen implementing the nutrition project over the villages. 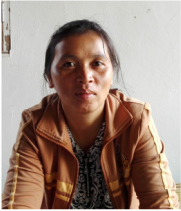 Since May 2014, she has been reassigned to the Income Generation team, following up all the beneficiaries and encouraging families to implement alternative livelihood activities. Samry assisted the ADF Nutrition Officer in activities concerning hygiene and nutrition for 2 years. He made sure that target communities got benefit from ADF's nutrition activities, including hygiene, nutrition and education. Since our nutrition program has ended in July 2017, Samry focus on hygiene and work closely with the target schools on Kulen mountain to ensure that the school-children are able to study in a friendly and hygiene environment. Coming from a nearby community, Samry has joined ADF since May 2015 and will lead the target communities on the mountain to adopt a hygiene and healthy way of living, under the supervision of the Development Program Manager. Sokchea, or "Chea", is from Anlong Thom village. He is fully employed by ADF as as tree nursery supervisor. He was previously in charge of the Income Generation center in Preah Ang Thom village. Chea is in charge of the 3 tree nurseries set up by ADF in the primary school of Ta Peng, Anlong Thom and Sangke Lak villages. Chea also assists locally all ADF activities and staff. Ms Cheung is from Anlong Thom village. Previously recruited as ADF cook, she has shown a strong interest in the IG activities. She is assisting Mout in transferring the technical knowledge to the local communities and she is closely following up all the beneficiaries of mushroom and vegetable farming, chicken and fish raising. Rapich graduated from the Cambodian Mekong University with a degree of Marketing, Business and Administration in 2016. She joined ADF in March 2017 for a new and important position within the organisation: Administrative, Finance and Communication Officer. She spend most of her time at ADF office in Siem Reap, with some regular visits to the field in Phnom Kulen. ​Ms Nimol is from Popel Village. She has been working for ADF from 2011 to 2017 as a Village Health Facilitator, during the Nutrition and Hygiene Program. 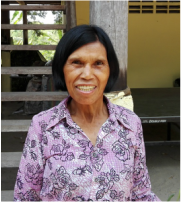 Considering her experience and skills, ADF has recruited her in August 2018 to assist the implementation of the Hygiene and Sanitation program (WISH), for the Sangke Lak and Khlah Khmum primary schools in Phnom Kulen. JB is a French archaeologist who has been working in Angkor since 1999 as an archaeologist for the Ecole Française d'Extreme Orient, INRAP and for the preventive archaeological unit at the APSARA Authority. Surveying Phnom Kulen since the early 2000, he completed his PhD on the occupation and mapping of Phnom Kulen during Angkorian and post angkorian time, at La Sorbonne, France. He set up the ADF in 2008 and is Program Director and Senior Archaeologist, running the "Archaeological side" of the ADF. ​Vann is a former teacher at Ta Peng Primary school and one of the successful beneficiary from the ADF Income Generation/Alternative Livelihood program. He joined the ADF team in 2018 to implement the WISH project, focusing on Hygiene and Sanitation. He is in charge of the infrastructures constructions for this project and also helps his colleague Mr. Chea for the supervision of the Tree nurseries. Dave is an Australian development expert who has been working in Cambodia, Myanmar and Vietnam for international organisations including CARE, Action Contre la Faim (ACF), the Canadian International Development Agency (CIDA) as well as the local organisation Neary Khmer, with a special focus on nutrition and agriculture projects. ​In 2015 and 2016, Dave "took a break" and worked for the WHO in Sierra Leon, helping the fight against Ebola. He joined the ADF in 2010 as Development and Nutrition Manager running the "Dev' side" of the ADF. Both from Anlong Thom village, Ming Thol and her daughter "Thou" are an essential part of ADF daily life and activities! The following people are still providing expertise on a regular basis: Bruno Fabry INRAP Surveyor, Maryline Gaudin Surveyor, Eric Llopis and Frédéric Conche INRAP Archaeologists, Nicolas Nauleau Archaeologist, Armand Desbat CNRS Ceramics expert, Ranet Hong Ceramics expert. Tuy Sophea, translator and facilitator. Pen Sarithy and Ngorn Pansyana, accountant and secretary .